Brighten up any room with this custom table lamp from Lamp-In-A-Box. Personalize the lampshade with original artwork, photography, or bold graphics to create a statement piece that will add instant style to your home decor. Choose your trim and shade material for a special, one-of-a-kind home or office accent. Choose from a tripod or table style lamp or just buy the shade. Just need a little bit of light? Light up any room with a custom-made nightlight. 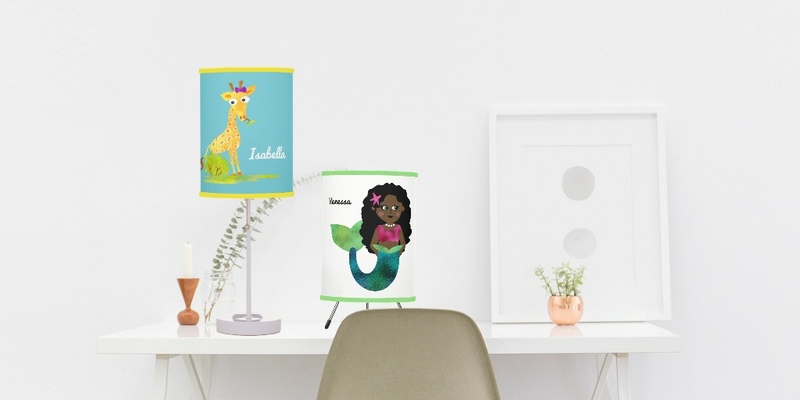 Personalize with beautiful graphics, kids names, and monograms for a one-of-a-kind night light to fit perfectly with your personality and décor. Dimensions: 3.7″w x 4″h x 1.5″d. and a light bulb is included. Showing 1 - 46 of 46 products.